Some of its features include attractive appearance; available in different designs and finish patterns; choice of availability in numerous sizes, designs, patterns and colors; available at market leading prices. 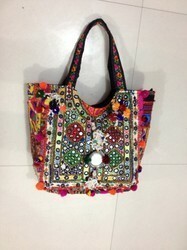 -This vintage purse is made in India, with multicoloured embroidered antique fabric, coins, mirrors. *This fabric handmade embroidery clutch also known as Banjaras. 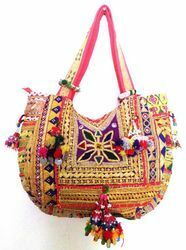 *Embroidery work is done with fabulous multicolour on cotton material embellished using vintage mirrors. We feel glad to introduce ourselves as one of the leading manufacturers, suppliers and exporters of excellent quality Banjara White Fringe Clutch. Be bold and vibrant with this ethnic African print handbag. This tote features a wicker handle. Completely hand-crafted in India. 14 wide by 16 tall.